An 8" wheeled A-bike Smart? Is it also an authorised product selling in mainland China? BTW, the A-bikes shown in the pictures on the following post look like imitations more than authorised genuine products. Oh! I've just noticed that the poster of the last post on the above thread uses a photo of my body as his avatar. Re: An 8" wheeled A-bike Smart? In the Mayhem's announcement(here), the Mind N Life took the licence for China market. Their Internet site is a-bike.com.cn which appeared on the sales page. Anyway, WOW, the 18" wheeled A-bike Smart has a wider width.. they modified most of plastic parts..! Everything is clear now, I think. Mind n Life are the licensed and authorised seales company in PRC. Although they have increased the wheel size on the 8" wheeled model, they have lowered the gear ratio from 6.81 to 5.25 as well. Therefore, the actual gear ratio of the 8" wheeled A-bike is 8" × 5.25 = 42 gear inches. This means that the bike travels about 3.3 metres per crank rotation (20cm × π × 5.25 = 329.87cm). The original gear ratio of the 6" wheeled A-bike is 6.81 (14 ÷ 8 × 35 ÷ 9), i.e. 6" × 14 ÷ 8 × 35 ÷ 9 = 40.83 gear inches. This means that the bike travels about 3.2 metres per crank rotation (15cm × π × 14 ÷ 8 × 35 ÷ 9 = 320.70cm). On the other hand, the lower Gear ratio could extend the life span of chains, especially the end-small chain. So I think it's a right decison..
so is this or isnt this the 8" abike? No, it is definitely not the genuine 8" wheeled A-bike. Here in the Netherlands I heard rumours about the official 8"wheeled a-bike too. Great to see pictures of the thing! I like the way it looks like it has no wheels at all! The 8"wheeled version looks slightly larger, because of the extended steeringbar and extended plastic connections. So it will suit my 2.01meters (6ft7) better. Also it will negotiate brick roads and potholes better because of the larger wheels. And I suspect it will have improved speed / travelled distance per pedal move, at least if the gearing ratio is the same as in the 6" version. This will help cruising at a better speed without pedalling very quickly. I guess i'll have to see and ride the two versions side by side to be able to decide. any opinions on it?? or shy away? 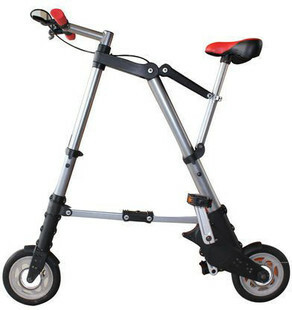 pss anyone have a 2 used handybikes here in the NY area?? Why are you sad that the 8" model is better? I just received this announcement from Mayhem, the 8 inch wheeled A-Bike is coming this month! I like the A8- bike name! It is nice to see a 8" wheel version being made at an offical level. It should get people interested in the A-bike design but not liking the 6" wheel size and not buying a copy version of the A-bike. I hope this version sells well. The 8" wheeled A-bike is now offically named as the "A-bike City". Ready to ride 'out of the box'. Included: detailed instruction manual, quick start guide, full warranty and special A-bike City toolkit. The new A-bike City has larger 8" wheels, carefully drilled to provide optimum weight and strength. The A-bike City's drive system provides the smoothest A-bike ride to date and a softened remodelled saddle makes those longer journeys more comfortable. The unique A-bike compactness and portability remain the same. Binch Shin wrote: On the other hand, the lower Gear ratio could extend the life span of chains, especially the end-small chain. So I think it's a right decison.. I wrote an e-mail to Mind & Life for asking why they chose that gear ratio on the 8" wheeled A-bike. According to the test result, he chose the lowest one which gives a better hill climbing ability and makes the bike a bit faster than the 6" wheeled models.